S. 1016 x 812 mm. 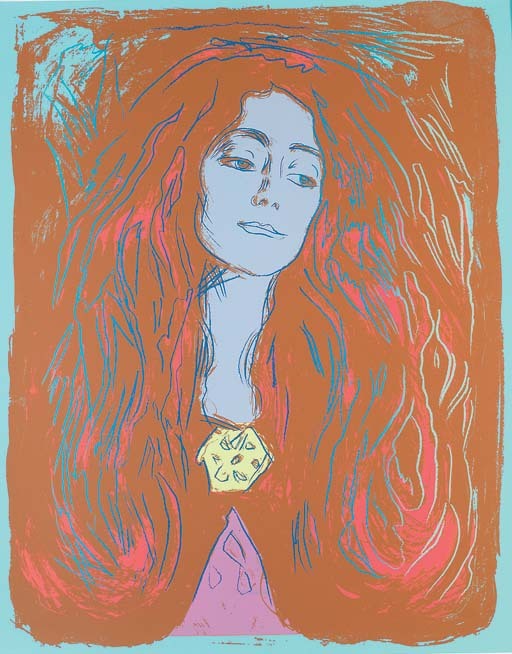 Warhol's Eva Mudocci (after Munch) was commissioned for an edition, but the project was abandoned and no edition was ever published. Only a few proofs in different colour versions were ever printed. The subject is based on Edvard Munch's iconic lithograph The Brooch. Eva Mudocci (Woll 244). The portrait from 1903 depicts the British violinist Evangeline Muddock (1883-1953), who took the italianised stage name Eva Mudocci. Munch had met and fallen - unrequitedly - in love with her in Paris in spring 1903.